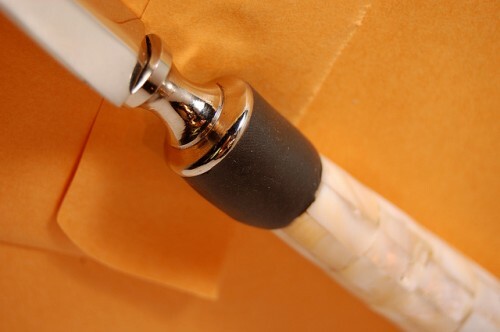 After my first repair job with sugru, I remembered that I had this letter opener that was in need of repair. My wife had given it to me after she got sick of seeing me open letters with our kitchen knives. 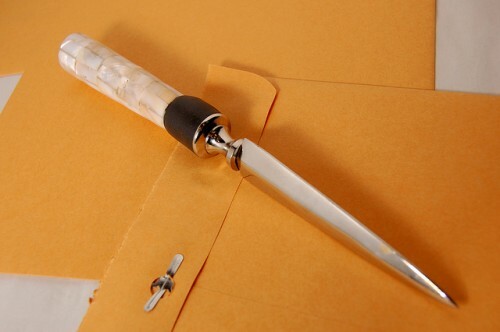 It’s a great looking letter opener, and the tape I had on it was not doing it justice. Note that it’s really hard to get sugru smooth. 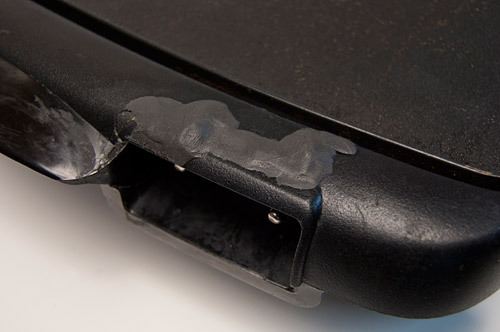 This is better than my previous attempt, but I can still see my finger prints in the sugru. Maybe I need to wear some rubber gloves. 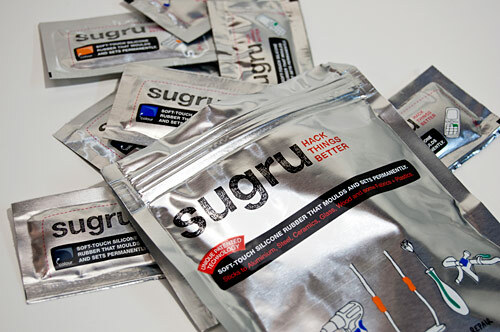 My main complaints about sugru? I wish it were easier to get, and that it lasted longer. I’ve still got a bunch of packets and now I’m starting to feel pressured to use them before they expire. It would be great if the local hardware store carried sugru so I could just go pick up a packet when I need one… of course they’d still have to deal with the expiration problem, which is something most things in the hardware store (besides the candy!) probably don’t have an issue with. I still think it’s doable, as sugru is pretty darn cheap, so even if it cost double what it does online, it’d be a good deal. I remember hearing about sugru last year, and looking through some of the ways people have used it, and thought I should get some of this magical substance to play with. What is sugru? Well, it’s a magical material that cures at room temperature, is self-adhesive, waterproof, flexible, and dishwasher-proof. See the blog for more info. One thing that’s been broken in our house for a while is the electric griddle. I’ve had it for a long time, and it still works, and I’m a fan of repairing rather than replacing things, as it helps save money, as well as the planet. We’ve been using the griddle for years, but have always been annoyed at the cracked edge piece. I ended up drilling a few small holes and twisting up some wire to bind the broken pieces together. Wire worked great for this. I didn’t want to mess around with trying to fit a small piece of metal, or any sort of screws in place. But the wire isn’t exactly pretty… and it’s got those pointy ends. 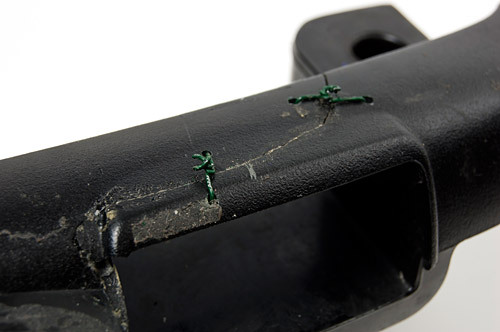 sugru to the rescue… I took the black sugru and molded it around the top of the crack, covering the wire. It’s still not the prettiest thing in the world, but it’s a big improvement.